Did you know the average office worker uses 10,000 sheets of paper per year? Wowza. I didn’t realize that paper made from wood pulp is a relatively recent development. Up until the 1880’s, all paper was made from recycled rags, a process that was first invented by a Chinese eunoch, Ts’ai Lun in the year 105. He’s maintains rock star status in Asia to this day. Shows what you can do when you don’t have too many balls in the air. It wasn’t until 1500 years later that anyone considered another option. French scientist, Rene-Antoine Ferchault de Reaumur had a fascination with insects. On a walk through the woods, he came upon an abandoned wasps nest and realized the papery structure was created from macerated wood pulp. Another 200 years of trial and error passed before Friedrich Gottlob Keller cracked the code, setting in motion an incredible era of deforestation and an industry was born. Artist Jen Stark knows how to wield an X-ACTO knife. 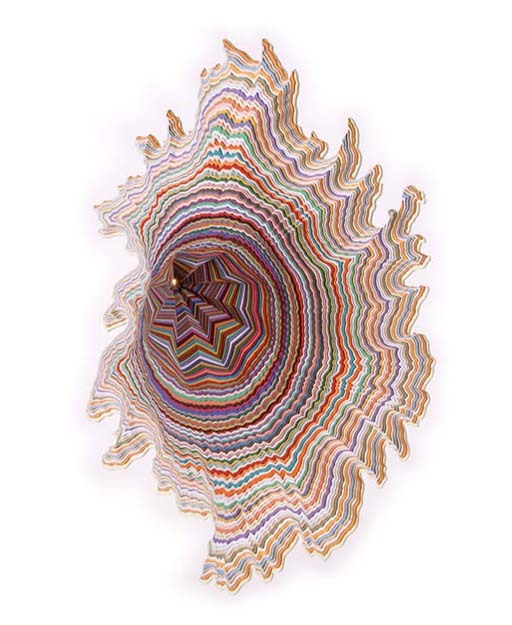 Her sculptures are made from layers upon layers of paper manipulated into fantastic forms. I just try not to cut myself with my x-acto. This hits me like Organic Hard Edge Abstraction (contradictory terms, I know) meets Historical Art-making Traditions of various sorts. Very cross-genre, unless there’s some tidy way to categorize this work of which I am unaware. Beautiful and thoughtful. Was I before? Visually Addicted. I know I am now! Wow! This is seriously amazing! Thanks for sharing! I love your blog.